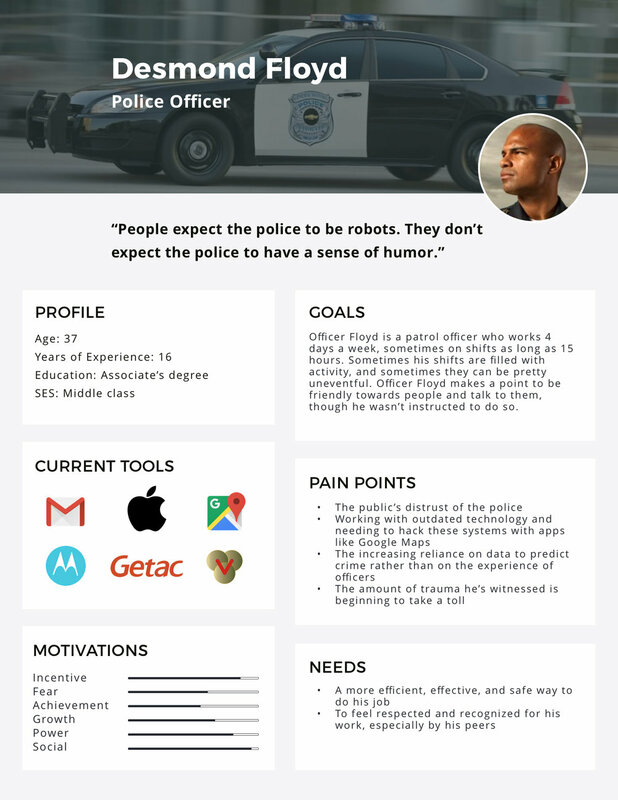 My90 is a mission-driven SaaS company that makes the criminal justice system more accountable and equitable by collecting feedback on interactions with the police and translating public sentiment into actionable intelligence. Recent events have exposed the degree of mistrust between police and the communities they serve, making community engagement a top priority for law enforcement leaders. However, police departments have historically had no way to collect data from communities, making it difficult to incorporate community feedback into decision-making. My challenge was to design a platform that would automate data collection, analysis, and visualization for police departments in real time. Before, My90 would manually compile and analyze data in PDF reports after collecting feedback from community members via SMS. A major pain point from a Police Chief's perspective is that departments lack ways to systematically include the community as a stakeholder in policy and decision-making. Data simply isn't collected, and even when it is, police departments aren't sure how to use it effectively. Additionally, departments face difficulty building trust with people who typically don't trust the police, such as African-Americans and other people of color. Existing community engagement efforts are like "preaching to the choir," in the words of one Police Chief. Community members often have strong opinions about their interactions with police officers, or on ways the police can help their community, but lack opportunities to provide feedback. Existing methods include visiting a police department in person or completing a paper form. In a world where people are accustomed to writing reviews with their smartphones and receiving responses from Customer Service within 24 hours, it's not hard to understand why police departments have trouble collecting feedback. According to a Police Chief, customer service is a "foreign concept." Furthermore, people who typically don't trust the police don't want to provide feedback out of fear of retribution and a lack of belief that things will change. According to the officer I shadowed during a ride-along, police officers have to constantly battle negative perceptions of them. They aren't trained from a customer service perspective and usually aren't encouraged to build relationships with community members. The officer also claimed that he is "old school" and has trouble adapting to new technology. For more on my research, read my blog post, "Improving the Criminal Justice System Through Human-Centered Design." In order to translate user insights into product features, I created an empathy map and decided on product features that would solve our users' problems. Next, I dove into designing the police-facing data visualization dashboard by brainstorming three different approaches to the information architecture. The first option prioritizes the format in which data is visualized. In other words, upon logging onto the dashboard, the first decision that users need to make is whether they want to view data geographically, on xy coordinates, as a list, etc. Next, I sketched out ideas for how this version of the dashboard might look (scroll right to view). The second option prioritizes the content of conversations in the information hierarchy. For example, a user who is curious about how safe community members feel in their neighborhoods should be able to immediately navigate to data related to that topic from a list of topics. (Scroll right to see my sketches for this version of the dashboard). The third option also prioritizes the content of conversations, but it groups data from conversations into quantitative, qualitative, and relational data–it's a bit of a hybrid of the first two options. (Scroll right to see my sketches). I decided to move forward with option 3 for the information hierarchy because it solved problems that the first two presented–there was less duplication of content compared to the first option, and it was a more organized version of option 2. I experimented with two navigational options for the platform. The first utilizes a top-nav as well as a left-nav with an additional left slide-out panel. I decided against this version because the combination of horizontal and vertical navigation could cause visual discord. The second utilizes multiple layers of a horizontal top-nav. I decided to build a prototype based on this version. The goal of user testing was to observe how people responded to the information hierarchy and navigational elements of the dashboard. I tested the platform on three administrators in law enforcement and one data specialist with crime data expertise. Users wanted to view more data on one page without having to switch between different views; in other words, there was room for more information density. Users wanted a way to compare responses from people who placed a 911 call versus those who were stopped by the police in traffic, and in general, a way to sort responses based on demographics. Users thought that the data categorizations presented first in the information hierarchy–Overall, Quantitative, Qualitative, and Relational–were too vague. I decided to build an interactive prototype for Option 2 because it was more focused, less redundant, and more visually interesting. 1. Users were confused by the multiple filtering options–the filters on the left panel as well as the filters within the Demographics and Over Time tables. 2. In Prototype 2, when users filtered by Interaction Type, the map would change accordingly (see animation)–it would show points for Traffic Stops and Service Call interactions, and zip codes for Events and Other interaction types. However, user feedback indicated that the geographical data also had to take into account the type of question that was asked. For instance, it made sense to display data from questions such as "How satisfied were you with your interaction with the police" as points on a map, since each point would represent where the interaction took place. However, it didn't make sense to do the same for questions like "How safe is your neighborhood." Instead, it made more sense to display a respondent's area of residence. Prototype 3 addressed the problems of Prototype 2 by consolidating the filtering system and by altering the Geovisual table so that data from interactions with the police were displayed as points where interactions occurred, data from events were displayed as points where events took place, and all other types of data were displayed by area of residence. User Testing: The main takeaway was that users didn't realize they could select different types of questions under the "Select Variable" dropdown. It wasn't obvious enough that this was a call to action and a way to navigate across different types of data. In addition, the options presented in the dropdown were too text heavy and were difficult to read. For Prototype 4, I reimagined the top-nav menu by further clarifying the different types of data users could view, and adding visual cues with icons. This menu made the "Select Variable" dropdown unnecessary by incorporating the different data categories and questions into the primary navigation. User Testing validated that the new top-nav menu was much clearer and more intuitive than the previous version. Additionally, I designed and built more interactivity within the data tables. Lastly, I added a feature that would enable law enforcement leaders to view data from specific interactions with police officers in aggregate by precinct or other areas of interest. There weren't any major problems with Prototype 4 based on user testing, so for the final prototype, I focused on refining the visual design of the dashboard as well as streamlining the nuances of data visualization (i.e. using bubble charts instead of bar graphs to show three data points instead of two). I designed a homepage that enabled law enforcement leaders to take the pulse of their community within minutes. I also made strides in designing the Open Responses page, which enables users to sort free form responses by sentiment as well as topic. I also built further interactivity into the Geovisual tables–when users click on a point on a map, they are able to see details of the interaction without comprising the anonymity of the community member. For mobile, we decided to pilot a limited version of the dashboard that would capture the most important pieces of data. The idea was that, since police chiefs spend most of their day in meetings and not at their desks, they would need a way to access My90 in an efficient and focused way. Next, I collaborated with our engineering team to develop a demo platform for sales purposes. The product is currently in the final development phase with a target launch date of early 2019. The next product design phase will focus on gathering feedback from users to improve the current design as well as to prioritize the addition of new features. In particular, we want to measure how law enforcement agencies are utilizing community data to improve their policies and practices, which will enable us to quantify what return on investment looks like.